Men's Irish Setter® VaprTrekTM WATERPROOF Boots. 40% LIGHTER for better mobility. Truth is, they weight just 23 oz. each, yet they offer remarkable support and stability for the hunt. 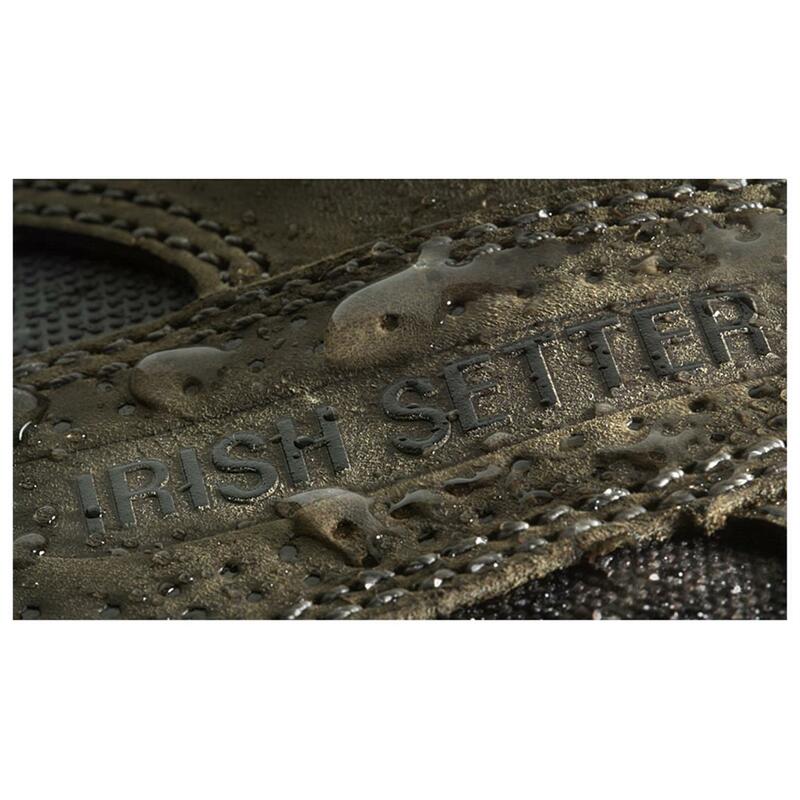 Irish Setter's advanced RPM outsole makes it happen. Wraparound instep protection for climbing treestands, riding ATVs, etc. Order these quality boots now! 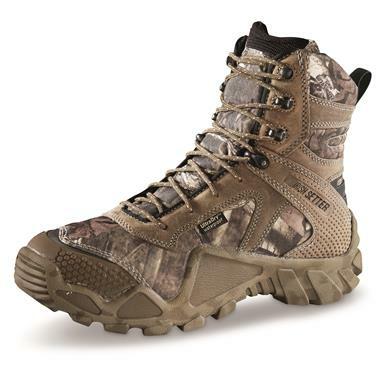 Irish Setter Mens VaprTrek Waterproof Insulated Boots, 400 Gram, Mossy Oak Break-Up is rated 3.3 out of 5 by 16. Rated 3 out of 5 by Smitty1 from WOW, I FOUND SOME BAD RESULTS FOR THE VAPRECK WATERPROOF HUNTERS BOOTS.THIS IS THE 2ND PAIR OF BOOTS, AND I HAVE NEVER BEEN SO DISAPPOINTED IN A REDW I AM SO SORRY THAT I HAVE PAID $$$ SO MUCH FOR A REDWING BOOT.THIS IS THE 2ND PAIR OF THE VAPRECK WATERPROOF BOOTS I HAVE BEEN THROUGH IN 2 MONTHS. BOTH PAIRS OF BOOTS LEAKED WATER SO BAD THAT I WAS AFRAID TO GO FISHING. NOT THAT I WAS IN WATER OVER THE LACES, BUT THE NEW BOOTS COMPLETELY LEAKED WATER AFTER I PUT THE MINK OIL ON THEM.I WILL BE CONTACTING REDWING SOON AS I GET FINISHED WITH THE REVIEW OF THE CHINA BOOTS. . . I WILL HAVE LEATHER BOOTS FROM NOW ON. . . DON'T BELIEVE WHAT YOU ARE TOLD ABOUT THE NEW TECHNOLOGY. .. Rated 5 out of 5 by David from Hunting Boot This boot is an outstanding buy, great comfort and outstanding support for your ankles while hiking or hunting. Rated 2 out of 5 by Chin from Could not stand lace eyelets Loved the boot but threading the laces thru a small upper eyelet was a dealbreaker. Not convenient, slows you down and that is with optimum conditions. Can’t imagine putting them on in the dark with some frayed ends. They would never fit the eyelet. Put some speed laces eyelets on them! Rated 2 out of 5 by seboar from they wear too fast buy those boots august 2016, hunt with them 2 days a week avg 10 miles a day from sept 16 to march 17. the thread on the sole completely disappeared even if i'm walking in forest and not on the rocks, the fabric on the fore foot get limed so much that it's not protecting against water since mid season. some stitch on the back of the boots broke, the inner sole fall apart days after days. put the boots to the trash after 1 season.too bad they are so fragile cause they were by far the most comfy boots i've ever used.maybe i choose the wrong model in the range. Rated 4 out of 5 by EasyEyes from Red Wing long standing tradition Boots were not a problem during the break in period. Wore them prior to my Elk hunt and had no problems with them. The outer soles had a tendency to slip due to the morning dew. Lugs could be deeper to prevent this from happening. The 400 grams of Permaloft insulation was just the right amount for the 30-40 degree weather. With that being said, I recommend these boots to any avid hunter. Rated 5 out of 5 by Zeb54 from These are the BEST boots I've ever owned! I've owned them all . I thought the Danner Pronghorns were great , but they have now moved down after discovering the Vaportrek. These boots are the lightest yet most supportive I've ever worn. I purchased these for early season bow hunting but liked the comfort and fit so much ,I now wear them almost year round . Pheasant hunting in S Dakota, grouse hunting in PA., they have even become my go to for spring gobbler season. This year alone I've put over 25 miles on them and they still feel GREAT!! !